Two games kicked off the official start of the 2016 World Cup of Hockey and the game's biggest star showed us exactly why he remains the biggest star. 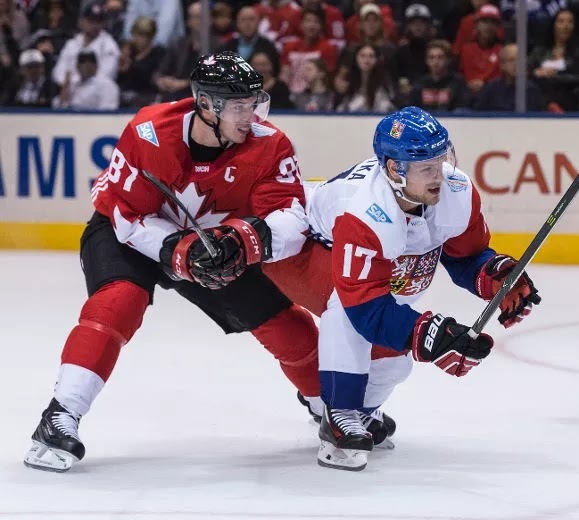 In just 13:04 of ice time, Sidney Crosby put on one of the most Sidney Crosby performances of his international career. Crosby tallied three points with one goal and two assists, further demonstrating that he's still playing at the top of his game following the Pens' Stanley Cup win in June. Team Canada defeated the Czech Republic 6-0 on Saturday. Finding linemates for Crosby can be a challenge, but Patrice Bergeron and Brad Marchand have been a complimentary fit since the trio was formed in training camp by Head Coach Mike Babcock. His goal banked off of Czech goalie Michal Neuvirth (current Philadelphia Flyer) was especially beautiful. "Wow," Bergeron said. "He was awesome. Really, really awesome." To say Team USA has been a disappointment has been an understatement. Since John Tortorella's roster was announced, people have been scratching their heads. Specifically, Pens fans were confounded by the absence of Phil Kessel from the roster. Why Tortorella and General Manager Dean Lombardi chose to load their team with physical, grinding players when the current theme is speed (See: Your 2016 Stanley Cup Champions) is beyond me. More World Cup of Hockey action skates on Sunday as Team Sweden (Patric Hornqvist, Carl Hagelin) takes on Team Russia (Evgeni Malkin) at 3p.m. (ESPN, SN, TVA Sports) and the speedy Team North America (Matt Murray) faces off against Team Finland (Olli Maatta) at 8p.m. (ESPN2, SN, TVA Sports).